The current climate in Tibet is critical and 2008 has provided the greatest opportunity the Tibetan community has had to make its voice heard as China prepares for the forthcoming Olympics, using its platform and media spotlight to promote itself on the world stage. This project aims to support the Tibetan cause through a celebration of Tibetan visual culture, offering UK audiences the chance to discover and explore this rich and vibrant culture. We’ve brought together an exciting selection of recent work, offering new insights into current life in Tibet and exploring the exile ‘condition’ of Tibetan refugees in India, taking a fresh, young and raw approach. We’ve achieved this through footage and images previously unseen in the UK, straight from the heart of the exile community in India and its burgeoning creative scene, providing a deeper understanding of the true reality of what it means to be Tibetan today. See the events page for details of the forthcoming programme. We look forward to seeing you at our events soon! offering an insight into the historical links between these two fascinating cultures. towards a peaceful resolution with China. Tsundue to offbeat rock band JJI Brothers to the more traditional arts institutes in Dharamsala, Northern India. Gyalpo, famed both for building iron bridges and founding Tibetan opera. village, he offered local children the chance for a better education at a school for Tibetan children in Ladakh. famous Oracle Lake, Lhamo Lhatso. My time in Dharamsala has now come to an end and 6th April proved to be a most fitting way to end this visit.In the morning, a prayer session took place at Tsuklagkhang, at which the Dalai Lama was later present. It took me back to my very first visit and the very first prayers I had attended in his presence on 12th October 2005, and it brought everything full circle for me – why I had come to this spot in the mountains in the first place and why I now keep returning to this second home -what the Tibetan community and Dharamsala have given me. Throughout this visit, I have been continually questioning my place here and yet I keep returning to the words of Norphel who I met here last summer. He told me back then, “The way I see you is that maybe you were my mother in a previous life, or maybe you are my mother in a life to come.” I was deeply touched by this sentiment and yet if I take this on board, which I feel I have to do, then I have a responsibility that ties me to this place. Equally, with Tashi May, she has become part of my world and I guess I am part of hers and I want to be present for her. So as I was sat amid hundreds of others at Tsuklagkhang I felt at peace and happy in the knowledge that I had been able to share this critical time with my Tibetan friends and colleagues, although very aware of how grave the Tibetan situation now is, and committed to doing what I can to contribute in a positive way. While extending my warm greetings to all Tibetans in Tibet, I would like to share some of my thoughts. 1. Since 10th March this year, we have witnessed protests and demonstrations in almost all parts of Tibet, even in a few cities in Mainland China by students, which are the outburst of long pent-up physical and mental anguish of the Tibetans and the feeling of deep resentment against the suppression of the rights of Tibetan people, lack of religious freedom and for trying to distort the truth at every occasion, such as saying that Tibetans look towards the Chinese Communist Party as the “Living Buddha”, is an ultra leftist statement and smack of Han chauvinism. I am very much saddened and concerned by the use of arms to suppress the peaceful demonsatrations of Tibetan people’s aspirations that have resulted in unrest in Tibet, causing many deaths, and much more casualties, detention and injury. Such suppression and suffering are very unfortunate and tragic which will reduce any compassionate person to tears. I, however, feel helpless in the face of these tragic incidents. 2. I pray for all Tibetans as well s Chinese who have lost their lives during the current crisis. 3. The recent protests all over Tibet have not only contradicted but also shattered the People Republic of China’s propaganda that except for a few “reactionaries”, the majority of Tibetans enjoy a prosperous and contented life. These protests have made it very clear that Tibetans in the three provinces of Tibet, U-tsang, Kham and Amdo, harbour the same aspirations and hopes. These protests have also conveyed to the world that the Tibet issue can no longer be neglected. These protests highligh the need to find a way to resolve the issue through “finding truth from facts”. The courage and determination of those Tibetans who have, for the greater interests of Tibetan people, demonstrated their deep anguish and hopes by risking everything is commendable as the world community has acknowledged and supported the spirit of Tibetans. 4. I deeply appreciate the acts of many Tibetan Government employess and Communist Party cadres who have, without losing their Tibetan identity, shown grit and sense of what is right during the present crisis. 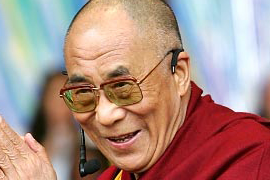 In future, I would appeal to the Tibetan Party cadres and Government employees not to look always for their personal benefit, but to work for safeguarding the larger interests of Tibet by reporting the real sentiments of the Tibetan people to their superiors in the Party and try to give unbiased guidance to for instigatinng and orchestrating the Tibetan people. 5. Presidents, Prime Ministers, Foreign Ministers, Nobel Laureates, Parliamentarians, and concerned citizens from every part of the world have been sending clear messages to the Chinese leadership to stop the harsh crackdown against the Tibetan people. They have all been encouraging the Chinese Government to follow a path where a mutually beneficial solution could be reached. We should create an opportunity for their efforts to bring about positive results. I know you are being provoked at every level but it is important to stick to our non-violent practice. 6. The Chinese authorities have been making false allegations against myself and the Central Tibetan Administration the recent events in Tibet. These allegations are totally untrue. I have made repeated appeals for an independent and respected international body to conduct a thorough investigation into the matter. I am sure this independent body will uncover the truth. If the People’s Republic of China has any basis to back their allegations, they need to disclose these to the world. Just makign allegations is not enough. 7. For the future of Tibet, I have decided to find a solution within the framework of the People’s Republic of China. Since 1974, I have sincerely remained steadfast to the mutually beneficial Middle-Way Approach. The whole world knows this. The Middle-Way Approach means that all Tibetans must be governed by similar administration that enjoys National Regional Autonomy and all the provisions in it, self-rule and full decision making, except for matters concerning foreign relations and national defence. However, I have said it from the beginning that the Tibetans in Tibet have the right to make the final decision for the future of Tibet. 9. Our struggle is with a few in the leadership of the People’s Republic of China and not with the Chinese people. Therefore, we should never cause misunderstanding or do something that will hurt the Chinese people. Even during this difficult situation, many Chinese intellectuals, writers and lawyers in Mainland China and other parts of the world have sympathised and shown un their solidarity by issuing statements, writing articles and offering pledges of support that is overwhelming. I recently issued an appeal to the Chinese people all over the world on 28th March, which I hope you will hear and read. 10. If the present situation in Tibet continues, I am very much concerned that the Chinese Government will unleash more force and increase the suppression of Tibetan people. Because of my moral obligation and responsibility to the Tibetan people, I have repeatedly asked the concerned leadership of the PRC to immediately stop their suppression in all parts of Tibet and withdraw its armed police and troops. If this brings a result, I would also advise Tibetans to stop all the current protests. 13. Finally, I want to reiterate and appeal once again to Tibetans to practise non-violence and not waiver from this path, however serious the situation might be. A passionate voyage of self-discovery taking the viewer on a fast-paced journey into Tibet’s fractured past and deep into the exile community. The film will be preceded by a five minute short film made by a student from the Tibetan Children’s Village, Dharamsala, Northern India. Set against the magnificent backdrop of the Qinghai-Tibetan plateau, a Tibetan volunteer patrol faces a life and death struggle to save the endangered Tibetan antelope. A group of blind Tibetan students led by teacher Sabriye Tenberken and mountaineer Erik Weihenmayer go on an epic journey to climb one of the highest peaks on Earth. The film will be preceded by a five minute short film made by a student from the Tibetan Children’s Village, Dharamsala, Northern India. Engaging personal accounts and interviews provide an insight into Tibet’s troubled past, taking us through rarely-seen rituals in remote monasteries, from the brothels and slums of Lhasa, to spectacular Himalayan peaks. Set in Lhasa at the time of the last uprising in Tibet in the late 1980s, Windhorse draws us into the lives of three young Tibetans as they struggle to make sense of their lives under occupation in a gripping and heartfelt story. The heart-warming story of the first ever international football match played by the Tibetan national football team. The film will be preceded by a five minute short film made by a student from the Tibetan Children’s Village, Dharamsala, Northern India. A touching portrait of life in exile as a young Tibetan. A coming of age drama about two Delhi students. An insight into life as a young incarnate lama living in exile today. This season of films and photography exhibition offer new insights into current life in Tibet, exploring the exile ‘condition’ of Tibetans living as refugees, taking a fresh and young approach. Through footage and images straight from the heart of the exile community and its burgeoning creative scene, these works will provide a deeper understanding of the multiple realities of what it means to be Tibetan today. The heart-warming story of the first ever international football match played by the Tibetan national football team. A passionate voyage of self-discovery taking the viewer on a fast-paced journey into Tibet’s fractured past and deep into the exile community. A group of blind Tibetan students led by teacher Sabriye Tenberken and mountaineer Erik Weihenmayer go on an epic journey to climb one of the highest peaks on Earth. The role of art in the creation and presevration of Tibetan cultural identity. Find the perfect first anniversary present for your wife 1st anniversary gifts for her Jewelry made from natural roses and precious metals!